Most horror-film fans, and a few history buffs, will instantly recognize the name that serves as the title for this Halloween edition of Beyond the Slimy Wall. For those who may not, Vlad Ţepeş Drakul, also known as Vlad Drakula and Vlad the Impaler, was a 15th-century Wallachian prince who protected Romania's sovereignty against Hungary and repulsed Turkish invaders. Hailed as a hero in his homeland to this day, he was seen by most of the rest of the world at the time as an unusually cruel and dictatorial ruler who was ruthless in battle, something even his own people acknowledged, albeit with the qualifier that these traits were vital to Drakula holding his country's enemies at bay. This infamy carried over to the many names by which Vlad Ţepeş is known; one of the names given him by the Turks translates as "the devil", and in fact Ţepeş roughly translates from the Romanian as "impaler", Vlad Drakula's favorite method of dispatching his enemies, thieves and liars, and others who displeased him. Most of the world today, however, knows him as the reputed inspiration for Bram Stoker's vampire, Count Dracula. And it is this mixture of historical fact and literary fiction that is at the heart of Vlad. For unlike most tales that invoke the name, Vlad's conceit is that Ţepeş himself becomes one of the undead, transformed, in effect, into Stoker's literary creation. The story follows four college students who have all been brought to Romania for a sort of honors program that will allow them to complete their theses on Vlad Ţepeş. One of them is a Romanian who studied in France, and in addition to what she needs for her research, she's brought along an antique necklace purported to have mystical powers and that was last worn by Ţepeş. And of course, since this is a horror film, the necklace places the girl and her three companions, as well as their protectors, members of a secret society pledged to protect the necklace, in danger, not only from those Earthly denizens who would possess it, but from supernatural forces as well. Now we're told fairly early on that the necklace must be returned to its rightful place or else there will be much bloodshed and death. And so the movie becomes not just the journey the students were expecting - a long hike to Vlad Ţepeş' ancestral home, the real Castle Drakula - but also one of discovery, of what the necklace can do, why its removal from said proper place was so dangerous and just how very, very far the group has to travel to accomplish its safe return. The plot is a wonderful mix of historical fact and romantic legends, with just enough supernatural elements thrown in to qualify as a horror film. In fact, the film is so educational at times that one might almost convince an open-minded teacher that it would be worth extra credit to do a report on, and if, like me, you just love learning new things, then there's double the pleasure in the flick. Plus there's lots of visions and mysterious fogs and music from the "children of the night" to keep it in horror-film mode. In addition to eschewing the usual character invoked by the usage of Ţepeş' name, Vlad also turns the vampire legend a bit on its ear. For the Vlad Drakula that walks the Earth in this film never really vamps out. There are some (very, very impressive) F/X where his face does a bit of a wolf-like transformation, but there aren't any fangs or any sucking of blood directly; in fact, the one time Vlad does drink blood, he does it from a cup, just like the rest of us. And the tale told of why it is his spirit does not rest easy and the form his torment takes is not your average curse/bitten by a vampire/vampire bat, either. It is, in fact, a nice morality tale cocooned in Greek tragedy trappings. The acting is surprisingly good in Vlad. It's almost as if everyone stepped up their games in order to meet the high bar established by the exceedingly literate script. You've not heard of the majority of these people, but they all turn in excellent performances, particularly Emil Hostina as a very wise priest and Francesco Quinn as the title character. Billy Zane also does an amazing job of sounding just like the Romanian natives who appear alongside him in the film; his accent sounded impeccable to these ears, and he never committed the cardinal sin of dropping it. The addition of John Rhys-Davies - who never gets enough quality work, as far as I'm concerned - as the narrator to the film's opening sequence is also a nice touch. 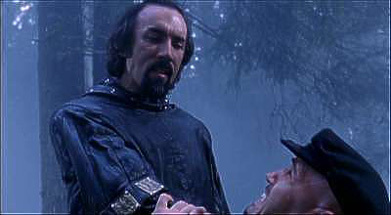 The cinematography, too, is excellent; the film was shot on location in the Carpathian Mountains, and included the ruins of a castle that Vlad Ţepeş himself inhabited. And while I'm quite the emotional one and will cry at a movie when it's warranted, it's certainly a rare horror film that can bring a tear to my eyes - except through sheer boredom - but Vlad succeeds. The grace note ending is the perfect finish to what is an exquisite film. At just over 98 minutes, Vlad comes nowhere near wearing out its welcome. The pace is brisk without feeling rushed; the exposition is woven into the story seamlessly; the F/X are above average; the cast wonderful; the dialogue believable and well-written; the locations breathtaking; and the music suitably atmospheric and haunting. But the thing that makes Vlad a cut above most horror films, and a unique entry for your All Hallows' Eve viewing, is its script, the fabulous blending of fact and fiction, historical events and characters and dramatic creations, that makes Vlad compelling entertainment. It could well become a new favorite of yours as it already has of mine, and I daresay were it to gain wider attention, it could one day rise to the level of a bona fide horror classic. Yes; it really is that good.